Erlotinib Tablets distributors, dealers & suppliers in Mumbai, India Oncology Medicines. 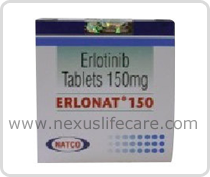 Uses:- Erlonat Tablets used for the treatment of non-small cell lung cancer. Erlonat Tablets is used in combination with gemcitabine for the treatment of pancreatic cancer that has spread to nearby tissues or to other parts of the body. Side Effects:- Closing of the throat, Swelling of the lips, tongue, face or hives, Increased coughing, Fever and chest pain, Eye pain or irritation.